Page 1-10 of this thread are about the steel version of the Dual 700C quasi-lowracer, Page 10+ are about the spiffy carbon fiber version of this bike. Here's Larry's Magic Bike, a dual 650C lowracer. I have thought about a dual 700C lowracer for years, but never thought the bigger front wheel would make that much difference. Larry proves otherwise. Of course it also has to do with him laying flat, which I'm still not sure I could do. A bit of drawing time shows that my long legs can indeed straddle a 700C wheel, without even having pedal strike. This would be a FWD steel lowracer, with rolled curved 2" tubes. Not super light as I will probably need to use .049" wall tubing to get decent rigidity out of that long bend, but it should be well under 30 lbs. Not extreme enough. Looks like a quasi lowracer. Too high. Why not go to the extreme and lower your head height by extending the wheel base. Also place your hands lower with tiller or remote. Larry's Magic Bike bike is more laid back and stretched out. Go for it Warren, your legs are long enough to get past the big wheel, me on the other hand can't quite stretch it, but I am trying. Alan, if the seat is too low, there may be problem with derailleur and knee and heal interferences. Hmm,I suppose I will already be looking through the headset, so a little more won't hurt. 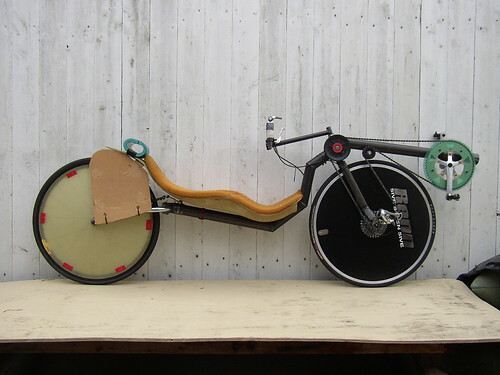 This bike would be just for racing anyway. OK, I will redraw it lower and more laid back and with remote steering and see it I can still reach with no crank overlap. I can always raise the seat angle but it's hard to go the other way without that extra wheelbase and bottom tube angle. Larry's bike is a dual 650, not 700. As is Rob English's Hachi. But then, Rob's about 5-foot-7, so us Homo Sequoius folk ought to have no problem with dual 700's. I call my bike a dual 650C midracer. It started out as a lowracer, but I could not live with the crank-to-wheel interference. So I raised the seat until that wasn't a problem then brought the rear wheel forward until it was next to the seat. I'd like to make a dual 700C midracer so I can use my Powertap 700C wheel. I thought I'd be using Garmin Vector pedals on the 650C bike by now, but I see they're now delayed until "summer 2012". I wonder if they'll be out in time for Battle Mountain. I sure would like to monitor and record power during those runs. Did you check if Garmin Vectors will work with cranks shorter than 170 mm? I vaguely remember seeing that they were limited to 170. I think the Polar/Look version is available (but more expensive and limited to the Polar computers). Warren, I wouldn't worry about pedal strike. I built a semi low in 2008 just for that purpose and at any speed over about 12 MPH you won't be turning the wheel enough to strike. The chainwheel is thing to design not to hit, but I think at even relatively low speeds it wouldn't be a problem either depending on Q factor. The (hopefully) employee running the Garmin Vector page on Facebook said the pedals could run with any length crank. I read the Look Keo Power (Polar) manual on line and saw they were limited to crankarm lengths from 170 to 177 mm. I emailed either Look or Polar and they said it could not be changed. Garmin Vectors are supposed to be $1500 a set and Look Keo Power are $2200. No news from Brim Brothers. We need a photo of the VeloX chassis with its 700c front wheel FWD and small rear wheel here. That is a nice setup. Delft uses a ETRTO 540 on the back (24"). On a non-faired bike I would not see a real reason to go there. AFAIK the only reason why Delft use the smaller wheel is to keep the fairing as compact as possible. On an open two wheeled bike my gut feeling is that you have more to gain using two large wheels. You only have to carry one spare inner tube and the rolling resistance for the 28" wheel will be less, next to the 540 size rim being difficult to find. The only down side is the slightly longer wheel base. There ya go. It does have just a little bit of crank overlap though. Unfortunately that makes it completely unusable on any real road (except sr305). IMO you're best of making a bike that is somewhat high but really laid back. Going really low to the ground doesn't give you any gain on an unfaired bike. Check out those disco riding shoes. No wonder he looks happy. A smaller rear wheel can unload some of the weight from the over burdened from wheel, and it also has less turbulence being hidden behind the rider. No point in building a bike lower? Really? Note the shin to axle clearance and location of derailleur. I don't think VeloX used a narrow BB. Shin-to-axle clearance is a major consideration as you've pointed out. Thus, until I can make my own narrow hubs/composite disc wheels, I'm relegated to using 406 wheels to keep the back of my knee above the axle on lowracer-type vehicles. The middrive derailleur is awfully high, too, but VeloX lets the rider sit up a bit for more power, overall height to be high and the length to be quite short. I did some more drawing and determined that having the seat that low would indeed require a narrowed hub to avoid knee to axle / derailleur issues. Laid the seat back another 10 degrees from the original design. Looks faster. I don't think the remote is going to buy anything here. I could always add it later. Looks like this allows knee/axle clearance. A dual 700C midracer might be a good application for moving bottom bracket design. Warren, it looks like just the bike for you to take to Apeldorn. And notice their new fairing design in the background. With a moving bottom bracket crank, chain ring/ wheel overlap would be a non-issue.